Last month I gave you all some pointers on how to maximize your small space, from using mirrors to dividing a space up by function to finding pieces that do double-duty. Well, here are a few more tips that will help make that 600-square-foot-studio or 2 bedroom with 2 kids feel a little more open and zen. Use light colors: Just like mirrors, light colors bounce light around. I am a huge fan of a black room, and in many cases dark colors actually recede so they can make a space feel bigger. That said, a light wall makes a room feel airy and bright, which goes a long way toward making it feel bigger. Light colors also usually blend in more with the ceiling and trim which means your eye doesn't stop as often and the space feels more expansive. Keep out the clutter: Just as with color, the more times your eye stops on an object while moving around the room, the less you experience the space as a whole. If you reduce clutter you reduce visual noise and again the space feels bigger - not to mention that clutter literally takes up square footage, so you are in fact enlarging your space when you purge. Clutter also takes up mental space, so having a simplified clutter-free space will make your home feel more serene and give it a sense of zen and airiness. Ceilings: Go darker, not white. I'm not suggesting that you paint your ceiling maroon, but step your ceilings down a few notches from white on the paint deck and you'll find that they feel higher. 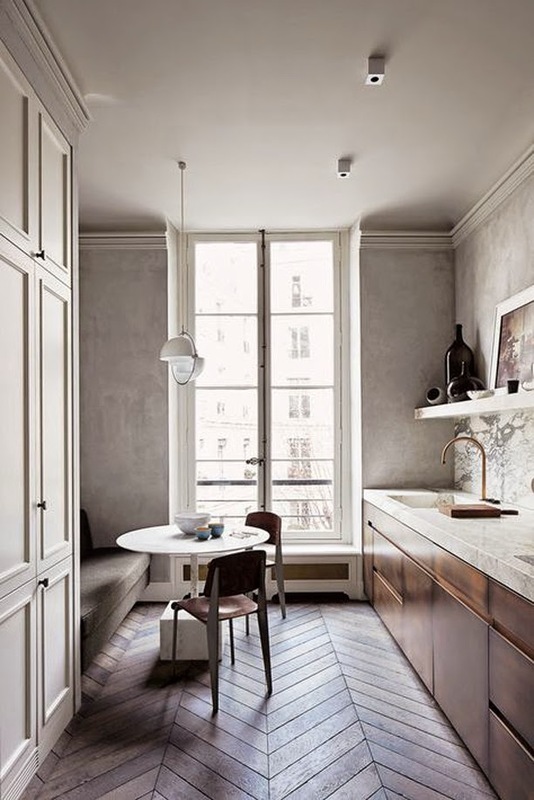 A light grey is so soothing and much more interesting on a ceiling than white-white-white. 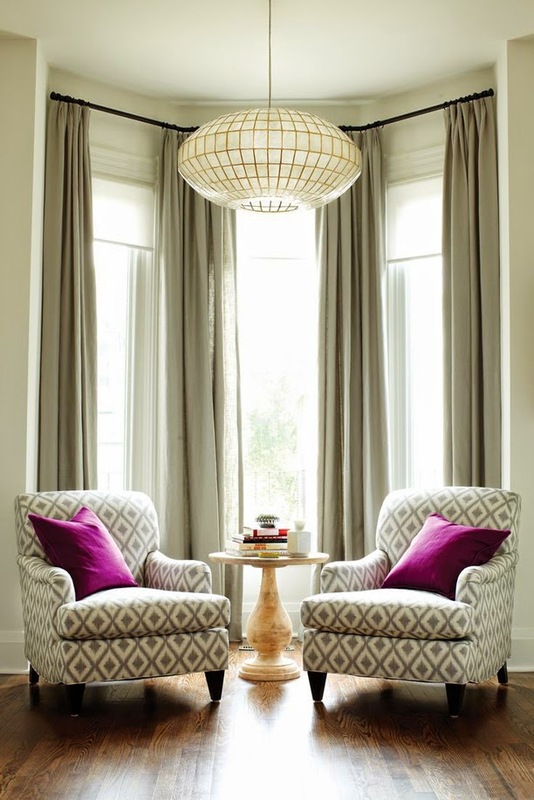 Consider your window coverings: A trick that almost all designers use is to hang drapery as high as possible. Your windows may stop 3 feet below the ceiling line, but hang that drapery rod a few inches below the crown molding! Your windows will feel much higher and the whole room will appear taller. Also, don't skimp and buy the shorter drapes; buy the longer ones and get them tailored to fit. If you're renting, consider doing a basting stitch so you can let out the hem in a future residence. If you already bought the shorter drapes, think about adding an accent band on the bottom to make them longer. And finally, if you aren't using draperies at all or would rather something more clean-lined, a fabric roman shade that has a sheer factor so that light comes in but that maintains your privacy is a great way to go. And again, if the drapery is closer to the wall and trim color, your eye won't stop and the room will feel larger. Go with one statement piece: Just because your room is small doesn't mean that you can't make a statement, but make your choices wisely. Choose one statement piece such as a boldly colored headboard or a large piece of art above the sofa and let everything else play a supporting role. A giant coffee table piled high with books might make a great statement but might not make the most sense in a small space where circulation is important. On the other hand, vertical pieces like a headboard or art can be bigger because they don't take up square footage but give a lot of bang for your buck. With all of that said, there is one more thing to consider. Some spaces are teeny-tiny and dark and often just hopeless when it comes to making them feel bigger. Sometimes it's better to embrace what you have. 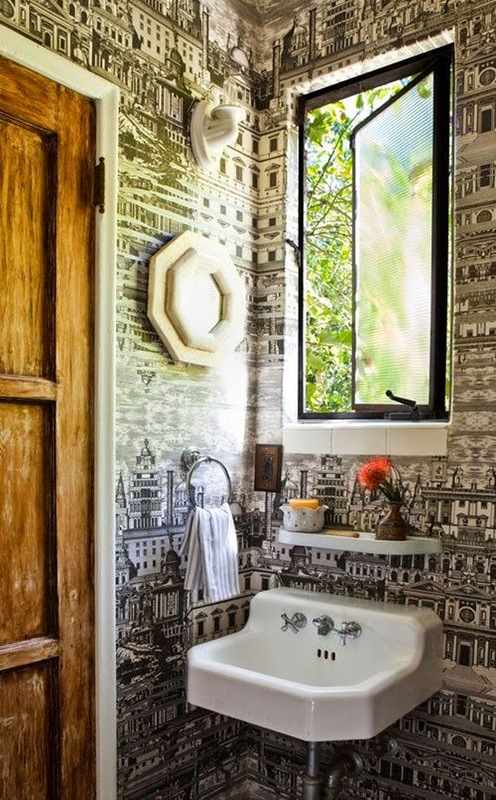 In a powder room that has a tiny window to an icky New York City lightwell, maybe it's better not to attempt the light and airy look; embracing dark and cozy is a better alternative. Go bold with color and pattern and see where that leads you. Perhaps you'll find that you love your small space even more.